You'll be £6.80 closer to your next £10.00 credit when you purchase Painting Wargaming Figures. What's this? I would say that any painter from beginner to intermediate could get a lot out of this book. If you are just starting out this is perfect for you, and if you are a confident painter with a bit of experience there are plenty of tips and techniques that could be added to your skill set...This book is educational without being condescending, a trap it could easily have fallen into, and covers a multitude of subjects under one cover. It is also very readable. And I certainly learned plenty from it! Although experienced painters will find some chapters unnecessary I still think they might learn a few tips and tricks along the way from Javier as he has spend thousands of hours painting miniature commissions. For novice painters I would certainly recommend this thorough book as it contains everything you need to know in a single volume. Javier offers us nothing more and nothing less than 395 images to describe his step by step and a magnificent size, a luxury that we do not usually find in this same type of publications and which I personally value very much. An ideal book to take a good learning base when painting figures for war games or wargames. Javier Gomez, better known in war gaming circles as ‘El Mercenario’ is an experienced and talented figure painter who enjoys an excellent reputation within the hobby. Here he shares the secrets of his success in this useful guide to painting miniature figures. The reader is taken through the process step by step, from the choice of materials and preparation of the figures, through to basing the finished model. Techniques such as dry-brushing, washes, shading and highlighting are all explained with numerous ‘how to’ photographs, indeed, over 370 full colour photographs of a variety of figures in various stages of painting are included. Specific sections of the book tackle a variety of subjects, such as mixing realistic flesh tones for different races, painting horses, guns and limbers, shields, flags, Napoleonic uniforms and camouflage patterns. The author demonstrates how his techniques and processes can be applied to all war gaming sizes, from 40mm down to 6mm. Whichever historical period – or science fiction/fantasy – and whatever size figure interests the reader, this book is a useful source of practical advice and inspiration. Highly recommended. 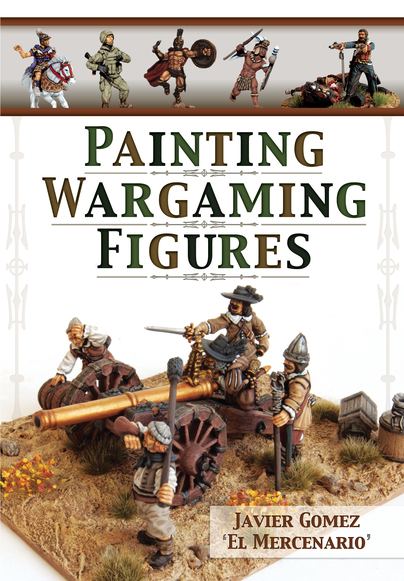 ... recommend this book to anyone who has maybe tried to paint wargaming figures in the past or is contemplating creating an army in order to play these types of games. I have used some of the suggestions here as well as the highlights for some of my own figures and they have produced improved results. The book is aimed primarily at the miniature wargaming community but is valuable for any modelers to incorporate these techniques into their painting projects. The quickest book review ever? This great book does exactly what it says on the cover. What? That's not enough for you? Okay...let's go and dig a little deeper. The book is primarily aimed at painting 28mm miniatures but there is a fairly detailed section in the back about adapting the technique to smaller scales (15mm, 6mm etc). Gomez opens by saying we are aiming to paint wargame models, not 90mm lifelike masterpieces. What follows next is the basics of paints to use. ... If you want a book which tackles very well the basics of colours (and a whole lot more), this is the book for you. This is an excellent book for both the experienced and less skilled painter. The instructions are clearly written and the painting guides are very useful for those people who can't decide what exact shade to use in the first place. The price of this book is excellent for what you get too. This is one I heartily recommend. A great little reference for anyone looking for help in hints and tips for painting wargame figures, and for any era... The quality of the final figures shown throughout the book give an excellent insight into the skill achieved by an experienced figure painter, and he has done a great job of sharing his experience with the rest of us. I always enjoy seeing the excellent standards we see on wargaming shows during the year and this is a very useful reference for anyone wanting to help with improving their work still further. Well worth having on hand with the many colour mixes and suggestions to be found for figures, and I was particularly taken with the sections on the various horses, and of all sorts of historical periods. Very soon after we started up Perry Miniatures we managed to acquire Javier's outstanding painting services for our figure collections. He is a true genius with a brush, with a great sense of colour that turns figures into masterpieces. His military and uniform knowledge adds a great deal to his ability to produce little painted gems.